Locally produced honey from our own hives dotted around the outskirts of Cardiff and Newport. Forget your supermarket honey with "a blend of honeys from the EC and the World". 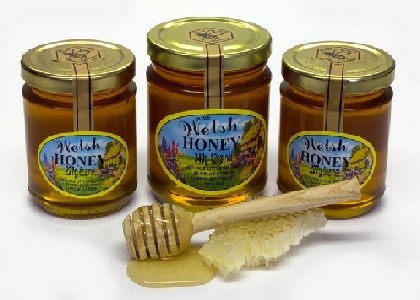 Get hold of some natural Welsh honey, extracted only from our beehives for long-lasting, seasonal-flavour. We don't heat treat our honey because that destroys some of its health giving benefits, we filter our honey 3 times then it goes straight into the jar, yummy. P&P of £3.85 included in above price.